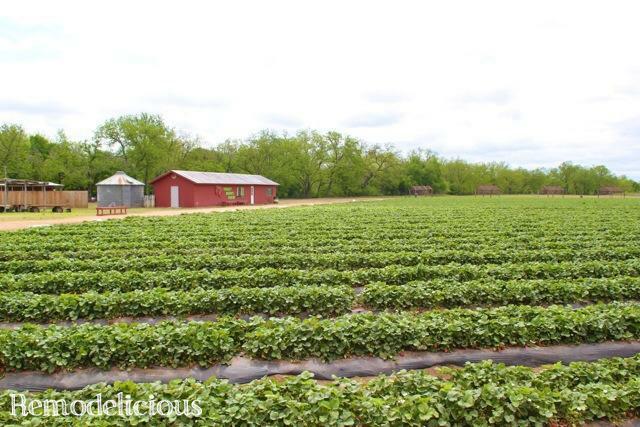 We recently visited a pick-your-own strawberry farm local to us called “Sweet Berry Farms”. We had been previously to pick pumpkins, but this was our first year to pick strawberries. YUM! We had a great time and the girls learned a lot (I think) about where food comes from. We have a small kitchen garden at home, but seeing it on a larger scale really helped them get an idea of how food that is part of our food supply is grown. 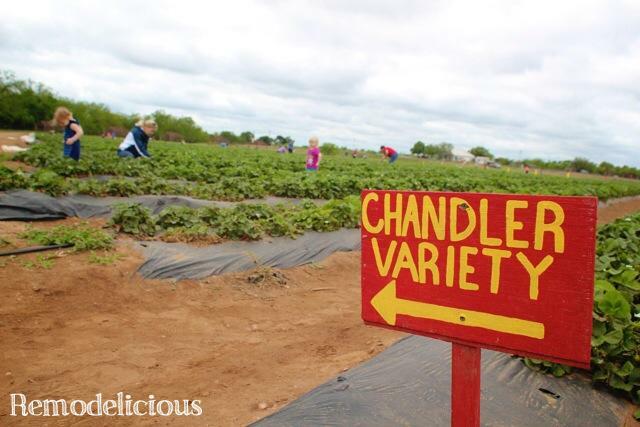 We are big on local, organic foods and I’d like them to understand why one lesson at a time. 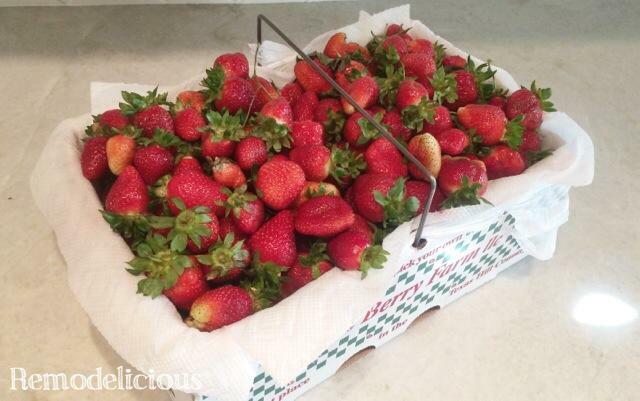 We ended up with a TON of strawberries. About 15 pounds of them for two households. 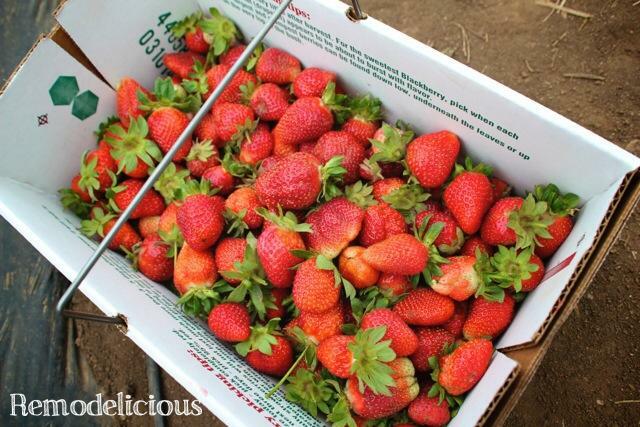 It sounds like a lot, but strawberries freeze well and they are a favorite food of our littles. We’ve use them to make smoothies and ice cream already. To keep all of our berries fresh for as long as possible (even the store-bought ones), found a little trick several years ago that works wonders. I was so sick of throwing out a half carton of nutritious berries after only a few days. Then, I discovered that doing a little vinegar wash on the before putting them into the refrigerator makes them last much, much longer, often weeks instead of days. Some do this in the sink, but our sink is never clean enough in my opinion, since when it is freshly cleaned, there are surely cleaning chemicals left behind. I use a large tubberware container and fill it part of the way up with water. 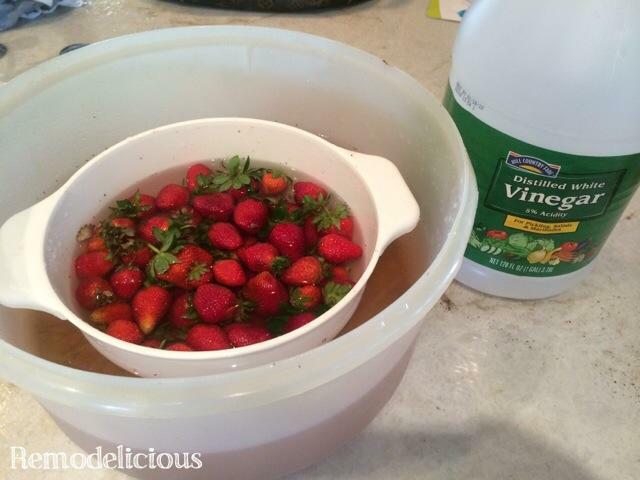 Than I add in a 1/2 cup or so of vinegar (it doesn’t have to be exact) and add the berries to the wash in a clean colander. I let it soak about 5 minutes, then shake and roll the berries around and let them sit another 5 minutes. I give them a quick rinse and then put them into the refrigerator in a fresh container (not sealed). The berries are brighter after washing and last exponentially longer. We do this with blueberries, raspberries, blackberries, strawberries, and even a lot of other fruits and vegetables. It may not be beneficial to all foods, but it works great for cleaning off the dirt, pesticides, and other microbes that we certainly don’t want to eat (and that help the food spoil in a hurry). I’d love to put these in some of those adorable ceramic berry tubs after washing, wouldn’t that be so cute? They are on my wish list for sure. you never mentioned the mixture of water to vinegar. I understand you said a half cup of vinegar and the mix doesnt have to be exact but how much water? a cup is a lot less than a liter…. I’ve never measured it, but I usually use a large mixing bowl so more than a cup or liter, about 1/2 a gallon.